Some 14-year-old girls ask their dads for an iPhone. Some want earrings. Others want to go to parties where the adult supervision ranges from less-than-ideal to nonexistent. All Haley Hall wanted was a 17-inch steel sword -- to swallow. For weeks, the bright-eyed, 5-foot-5 Georgia girl had been slipping away from the rest of the family, to unlock the centuries-old secrets of tilting your head back, opening wide, and putting a lethal weapon down your throat. She began practicing with a wire hanger and spoon -- as many sideshow greats have done -- learning to relax her gag reflex. But being able to push a hanger to the deepest reaches of her esophagus wasn't necessarily the hard part. She still had to tell Mom and Dad. "My father knew something was going on," she told HuffPost Weird News. "I typically don't lock myself in my room for hours in a night." But Jeff Hall and his wife encourage their daughters in a range of activities. Haley is a black belt in karate, shoots guns and bows, and rides dirt bikes with her sisters, college-bound Rebecca, 17, and Maggie, 11. To Jeff, Haley was simply combining her love for physical challenges with her greatest passion -- theater. "I was pleased that she came and told me what she was doing rather than go off on her own, so I was happy," says Jeff, a general contractor in Covington. "I had taken some pre-med classes, so I know the human anatomy can accommodate a sword, if it's done right. "I joked that she just had a bad case of middle child syndrome and really needed to stand out," says Jeff. But as a guy who throws knives and tomahawks from time to time, he might know from where his daughter's ambitions come. "I'm lucky," Haley says. "My mom is very supportive, too. She's worried for me at first, but she knows that I'm careful." 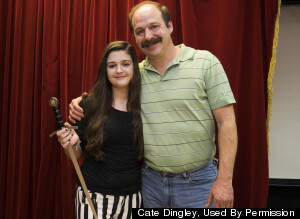 Now, not long past her 15th birthday, Haley is recognized by Sword Swallowers Association International as its youngest female member (the next youngest is 21). Her first public performance came at Berry College in Georgia a few weeks ago, and her family is pressing for Guinness World Record certification. Her biggest gig yet came this weekend at the Seminar Of Sideshow Arts in Tampa before a smattering of the country's most renowned fire-eaters, knife-throwers and human blockheads. The Tampa area has long been the heart of the circus and sideshow community. The Ringling Brothers and Barnum & Bailey Circus makes its winter home in nearby Sarasota, and that is where you will find Clown College. On the outskirts of Tampa, you'll find Gibsonton, a town affectionately known as "Freaktown U.S.A." for being the longtime home of carnies and sideshow performers. Outside homes, you'll find dilapidated midway games and rides, parked for the winter. This town's most famous residents once included performers who were known on stage as "Priscilla the Monkey Girl" and "Lobster Boy." In the 1950s, Al Tomaini, a hulking 7-foot-11-inch giant, served as Gibsonton's police chief. He and his wife, Jeanie “The Half Girl," operated a diner. Jeanie, a woman born without legs, was typically perched on a stool near the cash register. Before settling down in Florida, they toured the country in the 1930s as “The World’s Strangest Married Couple." Though Gibsonton's sideshow community has greatly diminished, a stone monument stands at the edge of town dedicated to Tomaini, topped with a cast of his size-27 shoe. It was in this area that Haley was professionally reborn this weekend as "The Amazing Pandora," standing beside some of today's top sideshow performers, including Insectavora, a tattoo-faced fire-eating, pain-proof woman, who hammers nails up her nose and paints with a brush jammed up one nostril. Circus impresario Ward Hall (no relation to Haley) came up to the girl before the Saturday night performance to wish her luck. The 83-year-old sideshow operator and ventriloquist serenaded her with "I Want To Be Loved By You" and other kitschy Betty Boop songs, to welcome and calm her before the show. "It's all about concentration and showmanship," Hall, a father figure in the industry, said. And then the artist now known as "Pandora" took the stage, accompanied by two other sword swallowers. They hoisted their blades, and, as they say in the business, it was "Down the hatch, without a scratch," amid cheers and applause. "Haley impressed me. She has a lot of poise for her age," said Tim O'Brien, spokesman for Ripley's Believe It Or Not! "If she stays with it, she will be the face of American sword swallowing in the future ... or should I say, 'The throat of American Sword Swallowing.'" O'Brien and SSAI president Dan Meyer invited Haley to the St. Augustine Odditorium in Florida on Feb. 22 to celebrate World Sword Swallower's Day, an event celebrated at Ripley's museums throughout the world. Like any 15-year-old, Haley thinks a lot about what she wants to be when she grows up. 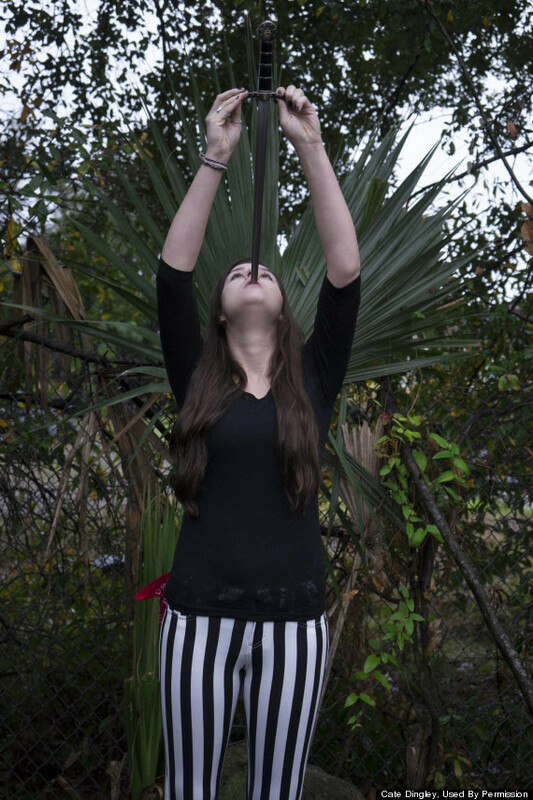 Sword-swallowing is just a part of what she wants to achieve as a performer. She sees herself as an actress. She loves everything from vampire movies to vintage Marylin Monroe flicks and anything with Jennifer Lawrence. "When I started doing this, my friends didn't know what to say. They thought it was cool and terrifying at the same time," she says. Her father also felt under a bit of scrutiny. "I had people go, 'Gosh, I can't believe you let her do that.' But I don't lose any sleep over that," Jeff Hall says. Haley is homeschooled, but she goes once a week to a homeschool group. "When the principal found out, she came up and asked her to be in the talent show," Jeff said. While other kids were playing piano and guitar, Haley became something of a sensation -- and had her first taste of stardom. "There wasn't a chair left in the auditorium that day," Jeff said. In the months to come, Haley plans to perform at the same Renaissance fair where one of the vendors a year ago reluctantly sold her the sword with which she now performs. She is already adding to her act. For Christmas, she asked for, and received, a straitjacket, from which she has learned to escape. She also picks locks and can get out of handcuffs. Of course, she's still just a kid, and she's not allowed to do everything. Her dad says she's not ready for fire-eating or impalement arts. But maybe in time. Ward Hall, 83, has spent nearly 70 years of his life working in the sideshow business.